Ho Chi Minh City authorities will help businesses that suffered losses at the hands of rioters during recent anti-China protests resume operations at the earliest, people’s committee deputy chairman Le Manh Ha has said. Immediately after hooligans damaged or destroyed five factories in the Binh Chieu Industrial Zone, city authorities instructed law enforcement agencies to protect people and properties from looters, fires, and other threats, the zone’s management said. 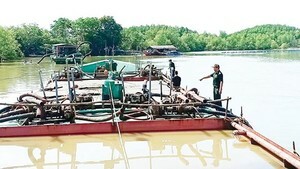 Vietnamese-owned Truong Loi Company is preparing to resume work, but expressed concern about suppliers who have been badly affected in the neighboring province of Binh Duong. A spokesperson for a Taiwanese paint company said he was moved to see workers protecting the company’s properties when they were targeted by rioters. City leaders should encourage Vietnamese workers to return to work, he said. Businesses in the zone have asked authorities to react quickly in case of more violence and set up a hotline. Taiwanese-owned Freetrend, whose plant suffered the most damage at the Linh Trung 2 Export Processing Zone, halted production for two days before reopening on May 16, its management said. Many of its workers have come to help clean up the plant and decried the violence by the protestors, it said. The presence of law enforcement authorities in the last few days has given them the confidence to return to work, it said. Ha praised the company’s managers for remaining in the city and restarting work together with their workers. City authorities have done their best to safeguard the lives and properties of foreigners as instructed by Prime Minister Nguyen Tan Dung, he said. The city police said they are continuing with measures to ensure the safety of companies. Sixty five out of 71 businesses in the Linh Trung 1 and 2 Export Processing Zones have been working again since May 16, according to the HCMC Export Processing and Industrial Zone Authority.